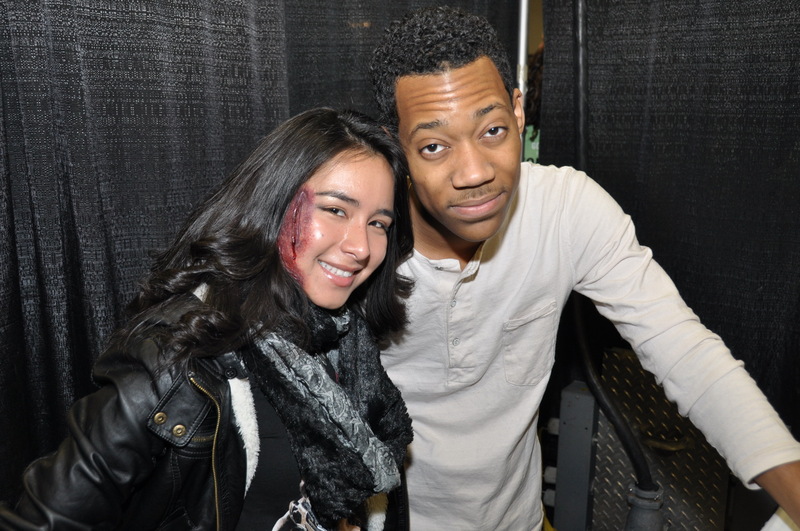 A review of the Walker Stalker Con 2014 in New Jersey, featuring The Walking Dead stars like Scott Wilson (Hershel), Alanna Masterson (Tara), Christian Serratos (Rosita), Sarah Wayne Callies (Lori), Tyler Williams (Noah), Lauren Cohan (Maggie), producer Greg Nicotero and many others. Also read about sightings of Norman Reedus (Daryl), Laurie Holden (Andrea), Emily Kinney (Beth), Jon Bernthal (Shane) and most cast members of the AMC show. This weekend I had the pleasure to attend the inaugural Walker Stalker Con 2014 at the Meadowlands Expo Center in New Jersey, and it was a great experience for The Walking Dead fandom. It was my first time attending this kind of fan fest, and I didn’t know what to expect, so I also can’t compare it with other similar events. But it was well worth the trip. 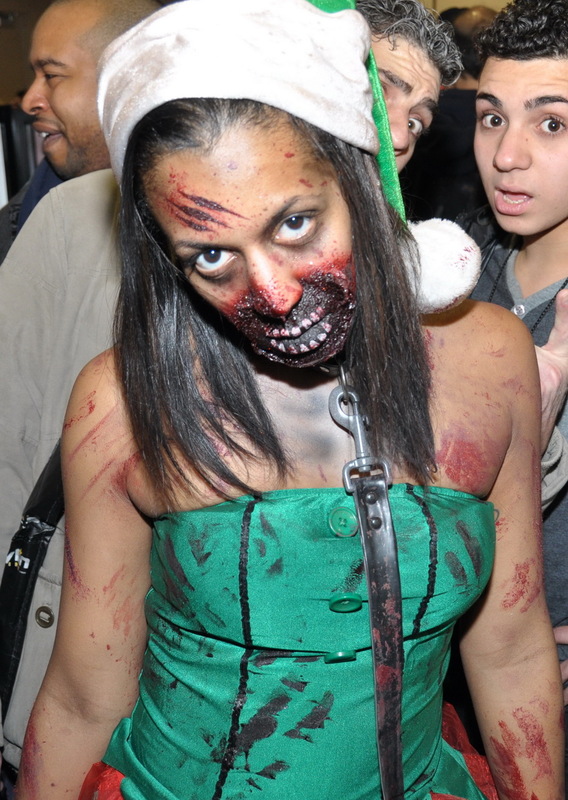 You can see lots of photos we took of The Walking Dead cast here! What was most shocking was the huge amount of fan that showed up. It was overwhelming, must’ve been thousands if not tens of thousands, packing the venue, and making a long line around the huge building in the hop of scoring some last minute tickets. Inside, besides a small vendor area and the stage where panels were hosted, the big hall was divided in booth for all the special guests. Kudos to the organizers who were able to get together pretty much all the major stars, past and present! The only ones missing were Rick, Carol and Michonne. I’m not sure if any other event, except maybe for Comic Con, was ever able to assemble such a cast. As for the Walking Dead fans, they were amazing. Patient and persevering, nothing could stop them, not even the packed crowds, huge lines, sometimes high prices, big waiting times. You could easily measure the value of each star by the lines in front of their tables, and they varied from 40-50 for less important ones, to 200-300 for the most popular (Beth first of all, then Glenn and The Governor). Norman Reedus (Daryl) was in a league of his own, with probably almost 1,000 in line at any moment, which forced the organizers to cut the line and assign people to different time slots. I heard a lot of complaints about the event, all stemming from overcrowding. Can’t say it’s anyone’s fault there are so many avid Walking Dead fans in the NJ / NY area, the only thing you can do better is have it at a bigger venue next time. But if so many people were willing to pay the premium prices and wait in line for hours, it must be worth it for them. Plus, if you think this was crowded, then you’ve never been to an NFL game. Now let me go over the Walking Dead cast members that I’ve seen and met at the Walker Stalker Con. I have to say some were extremely nice and friendly, others were acting like high-maintenance divas and had their staff yell at people even for snapping cell phone shots from the distance. But most of them stayed until late hours at night to satisfy all the fans even if the event was supposed to end at 6pm, and took few breaks during the day. Jon Bernthal (Shane) was the first one as you entered the room. He looked different from the clean-cut cop on the show, with his beanie and hoodie which made him look like a hoodlum, or someone who hasn’t slept for a few nights. Laurie Holden (Andrea), fresh of her role on Dumb and Dumber To, was the first “diva” we met. She looked willing to interact with fans who made it to the table, but warned everyone not to take unauthorized photos. The other people whose entourage was adamant about not breathing around their table were Lawrence Gilliard (Bob), Seth Gilliam (the priest) and Sonequa Martin-Green (Sasha). The first star we could get to was Scott Wilson (Hershel). He was a very cool dude, someone you can go out and have a drink with. Yeah, I know Hershell doesn’t drink, but I bet Scott does. 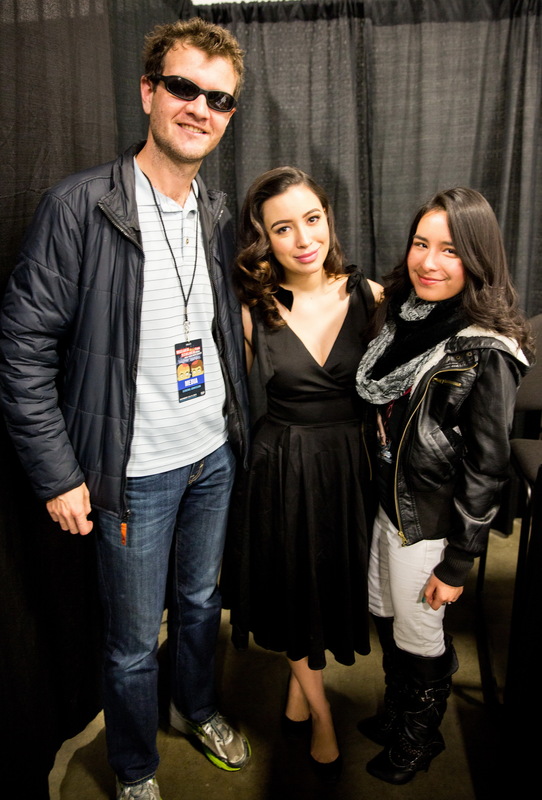 Christian Serratos (Rosita) was very nice and sweet. So different from the tough fighter attitude on the show. She spoke to us and took pictures with all our crew. 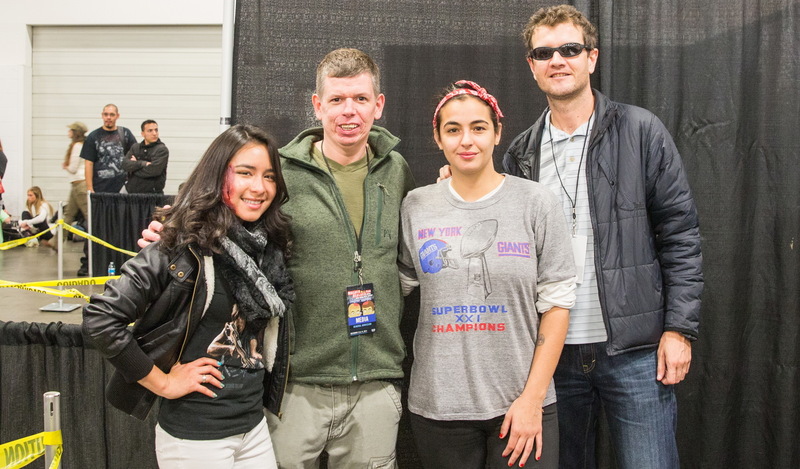 Alanna Masterson (Tara) was also extremely friendly. She looked like she’s at home, relaxed, running around to hug and pose with everybody, a very nice lady as well. IronE Singleton (T-Dog) was hoping around, promoting his band and concert that was taking place later in the evening. Chandler Riggs (Carl) had to face throngs of crazy teenager girls trying to get close to him. Brighton Sharbino (Lizzie) looked happy and all smiles, but fortunately for her, boys are not as crazy as girls. Looking through the crowd, the most popular costume seemed to be Rick. Maybe because many attendees were cops or had cops in the family, so it was an easy one to get. There were also some kids with big cowboy hats, to emulate Carl. I was surprised there weren’t too many zombies. For a zombie-themed con, you’d expect to see a lot more than the 10-15 I saw, even if those were were zombified had some very elaborate makeups. Among non-conventional (not to say out-of-place, or wrong convention) costumes were a Wonder Woman and a Freddy. Now with the popularity so visible by the size of each line, one can wonder if the missing cast members weren’t there because they were afraid of face the truth. Rick might still be considered the leader of the group, bu what if Andrew Lincoln came and he had a lot less people in line than Norman Reedus? Or even Emily Kinney? Or maybe Melissa McBride (Carol) would’ve found out she’s not as popular as she thought. Actually, you had a chart of who’s who right at the entrance, on the big signs listing the photo op price for each person, which ranged from $20-30 for marginal ones to $60-80 for the big stars. Like I said, besides Norman Reedus, it was almost impossible to get anywhere near Steve Yeun (Glenn) or David Morrissey (The Governor). And when Emmy Kinney (Beth) showed up, it was a huge cheering mob around her. We missed Michael Rooker (Merle), but his booth seemed very popular as well. So was Lauren Cohan (Maggie), but she allowed us to get up close and take pictures of her as she was smiling and interacting with fans. Newcomer Tyler Williams (Noah) was another outgoing, friendly cast member who talked to and took pictures with his young admirers. I had the pleasure to speak to Sarah Wayne Callies (Lori) but not so much about The Walking Dead as Prison Break (where she starred as Dr. Sara Tancredi). Apparently there are no plans to bring her back in the show, as it happened in Prison Break. It was also cool meeting Zach Gilligan from Gremlins, one of the favorite movies of my childhood. The new generation attending Walker Stalker probably had no idea who he is, so he was quite alone by himself at his booth and was happy to be approached. He asked me to take pictures of his “good side” (which is his left btw). One of the real stars of The Walking Dead is Greg Nicotero, who’s not just a producer but the chief FX designer responsible for so many zombie designs. Greg is a veteran of horror movie effects and won an Oscar for the Chronicles of Narnia. His staff guided me to the best spot to snap a few shots of him and his “heads”, including Hershel’s decapitated head. To conclude, this was a great experience and opportunity to meet almost all the stars of my favorite TV show. I was impressed at the devotion of other fans, at the star power some of these actors have, and at how so many of them are down-to-Earth friendly people. I’m looking forward to the next Walker Stalker Con in New Jersey! Was there a vendors room? Usually these cons have dealers selling merchandise. How was it? Lot of dealers doing business, or were the people just there for the stars? There were plenty of vendors, probably 1/4 of the building was for them. Honestly I didn’t spend too much time in that area, since it was a bit crowded, and as I had limited time I preferred to spend my time in line for the stars instead of merchandise.